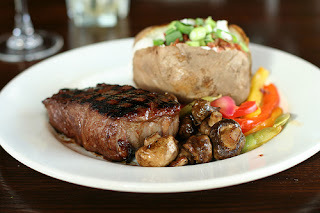 Behind the French Menu: Faux-filet or Contre-filet - A UK Sirloin, a USA Strip Steak. A faux-filet (contre-filet) steak with a jacket potato. A contre–filet or a faux-filet is a UK Sirloin Steak, in the USA a Strip Steak, a Kansas City Strip or a Delmonico. (N.B. USA and UK sirloins are not the same cut). The faux-filet or contre–filet makes great steaks; they come from just below the French entrecote, the UK and US ribeye. 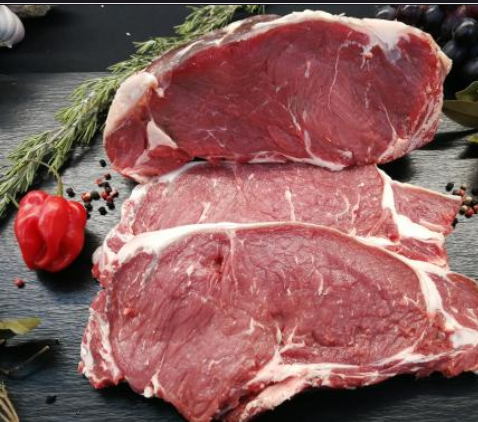 In the UK, this is a cut to the lower end of the UK sirloin steak, and despite the confusion created by the different names, it is the same cut as a US strip steak. Worry not, these are juicy steaks and if you have the choice then order yours as thick as possible. A contre-filet or faux-filet will be grilled, roasted or lightly pan-fried, and never well done. Well done this cut will be tough. 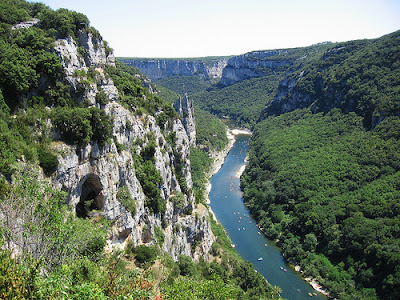 For tips on how to order your steak, in France, cooked exactly the way you like it click here. A contre–filet (faux-filet) with French fries. Duo de Veau: Ris de Veau aux Morillons, Pavé de Contre-filet de Veau Rôti – A two-part serving of veal: veal sweetbreads prepared with the “half-free morel” mushroom and a thick cut of a roasted UK sirloin. The half-free morel mushroom looks and tastes like the morel mushroom, but it has a smaller cap with a longer and edible stem. Contre-filet (Faux–filet) steaks ready for the grill. Carpaccio de Contre-filet de Boeuf et Copeaux de Parmesan - A Carpaccio from the UK sirloin, the USA strip steak, served with shavings of Parmesan cheese. Faux-filet de Bœuf Sauce Poivre Vert ou Cèpes - A UK sirloin, a US strip steak, prepared with a green pepper sauce and served with wild French cepes,(porcini), mushrooms. Le Faux-filet et Son Os à Moelle et Sauce Bordelaise – A UK sirloin served with its marrow bone and a Sauce Bordelaise. Sauce Bordelaise is made with veal stock, a Bordeaux red wine, and butter, shallots, and herbs. When the sauce is made with the addition of a marrowbone and moelle, bone marrow, then the menu will note Os à la Moelle. The more bone marrow added to the sauce creates a sauce with a velvety texture. A Contre-filet with French fries. Contre-filet de Boeuf Enrobé de Poivre Concassé Servi Avec une Sauce au Vin – A contre-filet (faux-filet) cooked inside a covering of coarsely ground peppercorns and served with a wine sauce. How to order a steak in France cooked the way you like it. 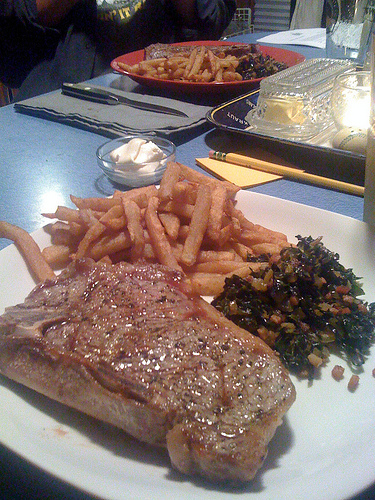 To really understand steak the French terms for ordering a steak look at the second part of the post: Ordering a Steak in France, Cooked the Way you Like it. Bleu - A very very rare steak. À Point - Perfectly cooked. For a steak, in France, this is a rare to medium rare steak. Entre à Point et Bien Cuit - Medium rare, a little closer to medium. Bien Cuit - A medium to well-done steak. 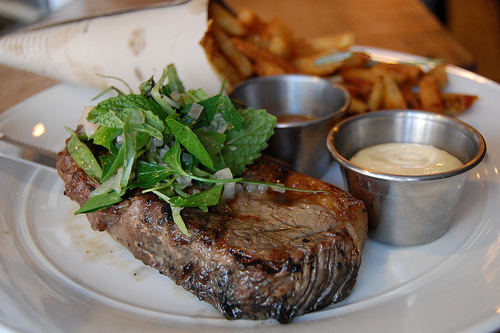 Très Bien Cuit – A well-done steak; however, do not order a contre-filet or faux-filet well-done, it will be tough. An entrecote, a rib-eye steak is more expensive but may be cooked well done. Steak with baked new potatoes. Faux-filet (contre-filet) is a good juicy steak and French chefs spend a great deal of time preparing steaks, far longer, and with much more attention than your average USA or UK steakhouse. If the chef realizes that the faux-filet or contre-filet, the US strip or UK sirloin steak, needs tenderizing he or she will not simply hammer it out; French chefs will rarely do that. 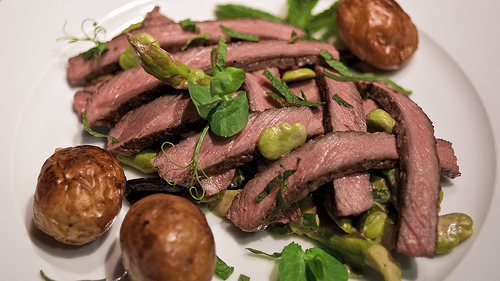 The French tenderize steaks and keep their shape by marinating them, usually in a red wine marinade. A sirloin was never named by an English King or Queen. At this point, it may be a good time to remove a rather unnecessary story that floats around USA and UK dining rooms. A sirloin was never created by an English King or Queen knighting an exceptionally well-prepared roast and creating a Sir Loin that is nonsense. Much of the English in today's kitchen comes from Norman French brought to England by William the Conqueror and his friends. The French, the word sur, means above; so the sirloin is, for the British, a sur-loin, a cut above the loin. From asking British, French and American butchers and looking at all the various diagrams, the British sirloin is mostly the USA short loin. 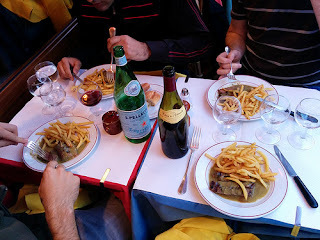 To order France's famous steak frites see the post: Ordering Steak Frites in France. Á la Moelle – Dishes Served With or Flavored With Bone Marrow. Á la Moelle on French Menus. Sweetbreads in French cuisine, Ris de Veau (d'Agneau) on French Menus. When sweetbreads are on the menu in France do not pass them by.